Thank you very much for your comments in last post and at least 2 of you guessed right about the rose! 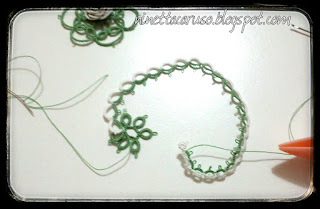 Thread is dmc size 80, white and green (col.num. 368). 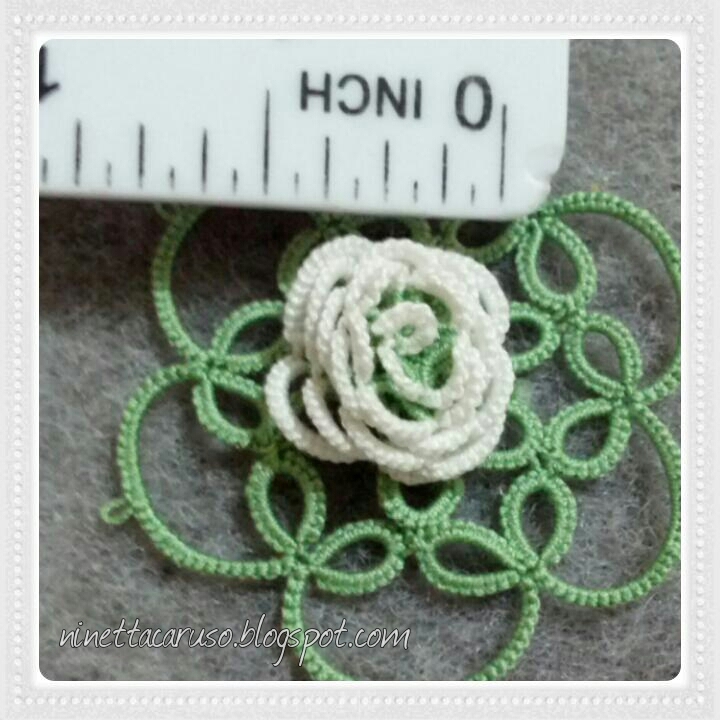 The finished rose measures half an inch in diameter. The white thread was hidden in the last SR with Miranda's method of finishing with an SSSR (link is on the sidebar on the left under "Resources"), but blocked with the green tail. I left a long green tail and passed it to the back side, inside the center of the rose. I started the motif below using that tail and another shuttle with green thread, that is the first round of the green motif that peeps out under the rose. It wasn't easy because of the 3D rose and the narrow space. But the rose ended up off-center (Note that Mr. Meticulous was here again!). 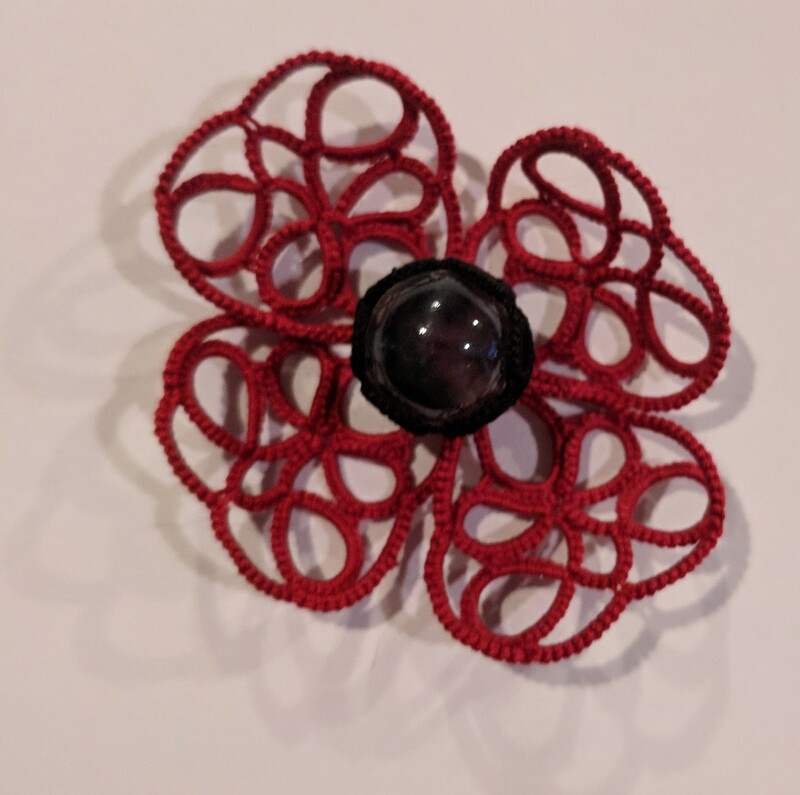 I followed the pattern from the last SR to the first, and everything was going well but then I mixed up the two long green tails while inserting them inside the rose, from the front side to the back. I wish I had the tools of a watchmaker :) Anyway, now it is positioned almost at the center of the base motif, but that resulted misshapen. I'm not sure though, so I'm on another lilliputian rose. Now I want to start as the original, not finishing the rose but tatting the motif and at the end winding the line of sr. I'll show you pictures in next post, maybe tomorrow. They are both beautiful and I like the white. 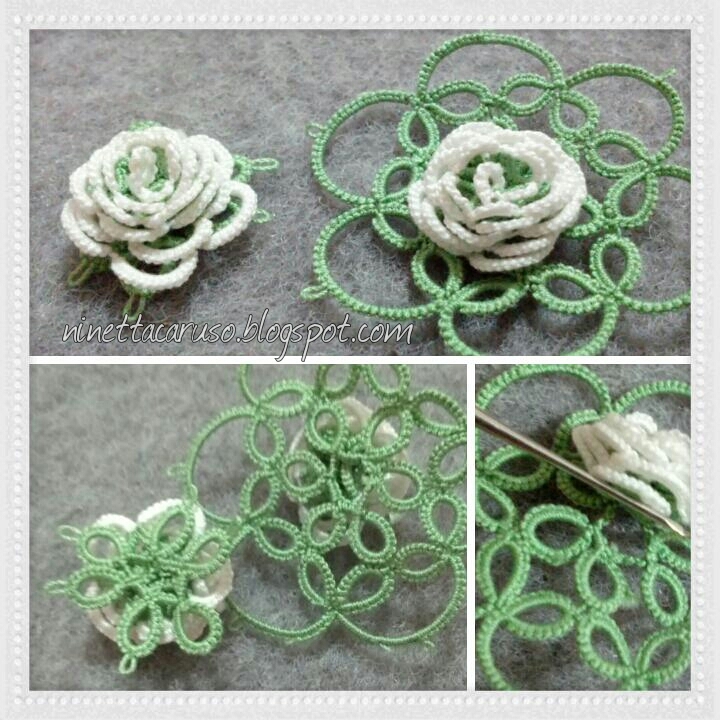 I did a couple of roses and rolled them up after tatting them. 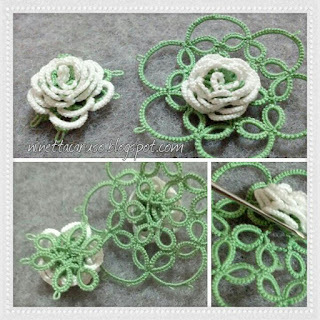 Your rose pattern is so smart and easy. I must try it. Thank you for such clear instructions.